Flashback Friday! What Will You Celebrate? | What's the Point? In 2008, I received an email from the Disney College Program Alumni group asking for New York City-based volunteers. The email stated that they had a "very special announcement" and that they needed some people to help make magic in Times Square. Of course, that's all the email needed to say to get me to sign up! When we arrived at a hotel in Times Square there were conference rooms filled to the brim with Mickey balloons! For the kick off to "What Will You Celebrate?" Disney Parks was giving out free Mickey balloons in Times Square with information about getting your free ticket to the parks on your birthday. We had a TON of fun. It was also nice reconnecting with other Disney College Program alumni. The program truly changes you and it's a part of life that you can't understand without going through it yourself. 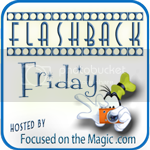 Many thanks to Focused on the Magic for hosting this Flashback Friday Blog Hop! Go check out the other great posts! What a magical experience to be able to bring the big announcement NYC!! That was lot of Mickey balloons bouncing around the city. Must've been fun to see! Thanks so much for sharing and for linking up to the hop today!! It was so much fun! I truly felt like I was a part of the magic. It was also funny to see jaded New Yorkers smile from ear to ear at the sight of thousands of Mickey balloons. Also one really cool part was that after we were done, my husband and I went to do a few other things in the city and no matter where we went, or how far away from Times Square we were, we saw someone with a Mickey balloon! It was so funny! What a great experience! We didn't get to take advantage of the free on your birthday promotion, but our friends did for their daughter. We didn't either. My birthday is actually October 1st so I couldn't be in two places at once! :) I really enjoyed the "Give a Day, Get a Disney Day" promotion they did the following year. I thought it was a great way to get people to give back to their communities. What a cool even and such a fun way to promote it! very cool, that seemed really awesome to be a part of of..